Not sure what to add to your holiday wish list this year? How about some must have items that will make your home smarter? While home automation is still a new concept, homeowners are embracing this trend with open arms and fingerprint scans. From thermostats to house locks, your home can be made to respond to your voice, your fingerprint, or your smartphone. Not only is it a great idea, it's a perfect gift! A learning thermostat is designed to learn how you live your life and what you need. 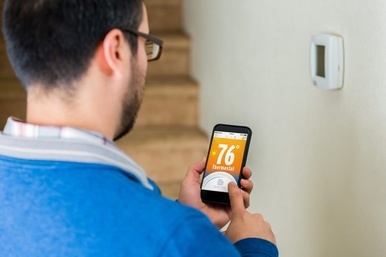 According to Nest, the best-selling brand, their thermostat device can pay for itself in just a couple of years by saving you a lot on energy. There are dozens of brands available, some from the largest companies, as well as start-ups. New computer technology and detection systems have been married to your heating and cooling system. Using these technologies and a great learning program, the Nest, and similar products, can be installed to maintain comfort in your home. The Nest learns your routine so that you don’t have program it. It hangs on the wall and uses things like motion detection to know when you’re in the room and when you are absent. The Nest’s biggest asset is that it’s extremely convenient. Once it has learned your routine, it turns the heat on and off, making sure that energy isn’t wasted when you leave and turns on in preparation of your arrival home. When the smoke alarm goes off, your heart stops and you begin searching the house. Several companies, including Nest, have created smart alarms that not only detect smoke and CO2, but also notify you by smartphone and even on your computer. These new style of detectors are designed to test themselves, let you know if there’s a problem, and alert you when something’s wrong. One of the things that you should decide is whether you want a battery-operated detector or one that’s hard-wired. Battery-operated are easier to install and will work even if the power has gone out. Detectors that are a hard-wired allow you to set it and forget it, removing the need to change the batteries. The Nest smart detector talks before it sets off an alarm. For example, it actually tells you that there’s smoke. Rather than simply sounding an alarm, it gives you a chance to check for burnt toast before it screams and wakes everyone up. A light bulb is a light bulb, right? Not when you can use your smartphone to control the light, including scheduling, turning on and off, and even monitoring energy usage. Gone are the days of a dark house. You can schedule these new LED lights to turn on and off based on your schedule. They operate from a hub that’s connected to wi-fi. Using an app on your smartphone, you can control the light. This might seem like a luxury, but making sure that the house is lit when the kids arrive home from practice is a simple convenience. If you are away, you can schedule the lights to turn on and off to deter burglars. These lights are more expensive than even CFL bulbs, but the convenience can be as rewarding. You might not want to convert every lightbulb in the house, but one in the living room or hallway can literally be a life-saver. Have you ever wondered if your garage door is open after you’ve arrived at work? What about when you were away for a couple of days? A smart remote garage door opener can make it easy for you to check, just by looking at your smartphone. Most burglars enter homes through open doors, especially garage doors. Being able to see if your garage door is open and close it remotely can help to keep your possessions and family safe. If one of the kids forgets their front door key or a neighbor wants to borrow a tool, you can open and close your garage door from anywhere. Simply grab your smartphone and check it from the office, bed, even on the sandy beaches of your vacation. Like the remote garage door opener, smart locks are designed to allow you to lock and unlock your doors remotely. If you don’t make it home in time to let the kids in from school or if your mother-in-law is coming and you want lock the house up tight (just kidding, Mom! ), smart locks let you do this from anywhere. Digital keys are a great thing if you have visitors or family coming. Visitors can download the app and you can give them virtual keys to doors. This lets them come and go without you needing to be home. It also prevents needing to hand out hard keys to everyone, also preventing them from getting lost. Some smart home products can be installed yourself, but hire a professional to ensure you can take advantage of these conveniences. The smartest tool is useless if it’s not installed properly. A professional can help you make sure that you get the most from these amazing devices and can even teach you to use them. After all, it took most of us a decade to learn to set the clock on the VCR!